*This seat has been discontinued* RECARO has been on the safety scene for a long time. Meet the Recaro ProRIDE! Safety stripes on the harness strap help ensure straps are not twisted. The ProRIDE allows rear facing from 5-40 lbs, up to 22.5″ seated height or 1″ from the top of the shell – whichever happens first. 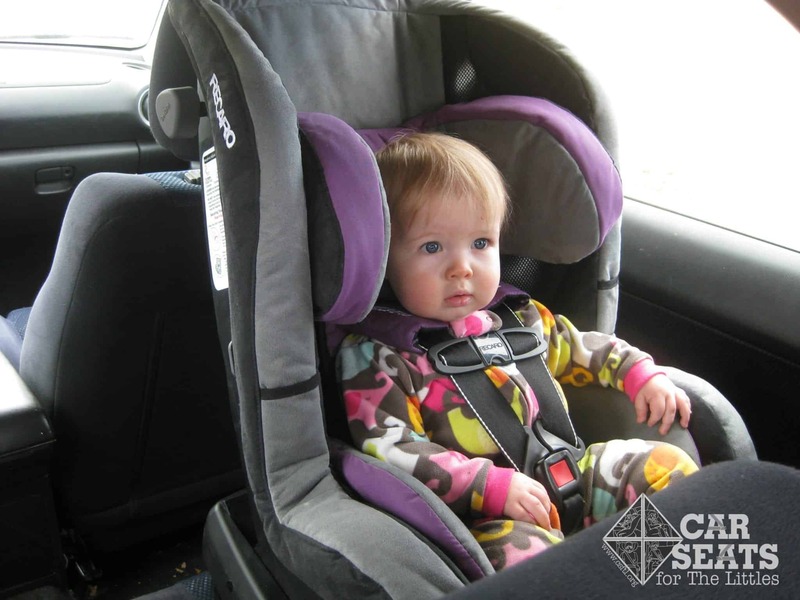 Although it starts at 5 lbs, the bottom harness slots are 10″ and much too high to fit a newborn, as a rear facing child must have the straps positioned at or below the shoulders. You can see our Huggable Images newborn Fiona, who is 7 lbs and 17″, does not even come close to fitting. The straps are significantly above her shoulders. The infant insert is not large enough to offer much of a boost. It was a nice fit on my 11 month old, who is 18 lbs and 28″. She is using the lowest harness setting. Rear facing installation was pretty straightforward – the lower anchor strap has a tail on each side, which makes it very easy to get a tight installation using lower anchors. Seat belt is easy as well, although the belt path is very small and a bit difficult to get the seat belt through. The major downfall of the ProRIDE is that it offers very limited leg room for rear facing children. This is not a safety concern, but it can be a comfort one for older children. It also sits up fairly high in the vehicle, and the combination of shallow leg room and height can make it difficult for loading and unloading a child, especially as they get older. My 5-year-old is exactly at the limits of the seat at 40 lbs and 22.5″ seated height. He wouldn’t ride in this seat since he is at the limits, but this photo gives you an idea of how an older child fits. It was very difficult for him to climb in and he had a hard time getting his legs configured once seated. The forward facing installation was equally easy thanks to the dual tightening straps on the lower anchor connectors. For a seat belt installation, the ProRIDE also has a seat belt lockoff for forward facing installation. The 18″ top harness slots leave ample growing room for older children, although the shoulder area may be a bit narrow for children at the top limits of the seat. The manual also limits use of the top tether after the child weighs 52 lbs, which is a disappointment because we know that using a top tether is a significant safety benefit for forward facing children. The RECARO ProRIDE offers some nice features: I appreciated the little pockets that keep the harness straps out-of-the-way when buckling, the no re-thread harness was very easy to use, and the safety stripe system makes it simple to ensure there are no twists in the harness straps. The rear facing seated height limit, lack of leg room and difficulty loading and unloading for rear facing were the major downfalls of this seat for me. Kids are safest rear facing until 3-4 years old, and the design of this seat would make that difficult to do without a lot of head bonkage and squishing to get into the seat. RECARO has recently updated the ProRIDE to the PerformanceRIDE, with all the same features and limits and the addition of the Hero Harness System, which are harness pad covers designed to help keep the harness from twisting. Neither RECARO nor Amazon.com sponsored this review. Opinions, as always, are all our own!